Employment opportunities within the energy and utilities sectors require a highly-skilled workforce with specialised competencies. Accurately performing a thorough background check on all new hires is a critical component to ensuring safety and security in the workplace. Misrepresentation of education or employment histories could result in violation of safety and security policies, negligent hiring lawsuits, or worse. 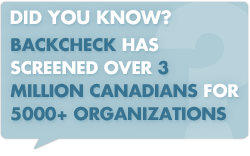 BackCheck is pleased to provide employment background checks and Supply Chain Security Programs to dozens of Canada’s leading energy and utilities based organizations. Our unparalleled depth of experience enables us to design relevant packages catered to screening skilled candidates for security sensitive positions. With all clients, we take a customized approach to packaging services ensuring we meet each of our clients’ screening needs. Contact BackCheck today to learn more about screening candidates in the energy and utilities sector.